Receivers coach Jelani Berassa takes the unit through a drill prior to Saturday’s scrimmage. 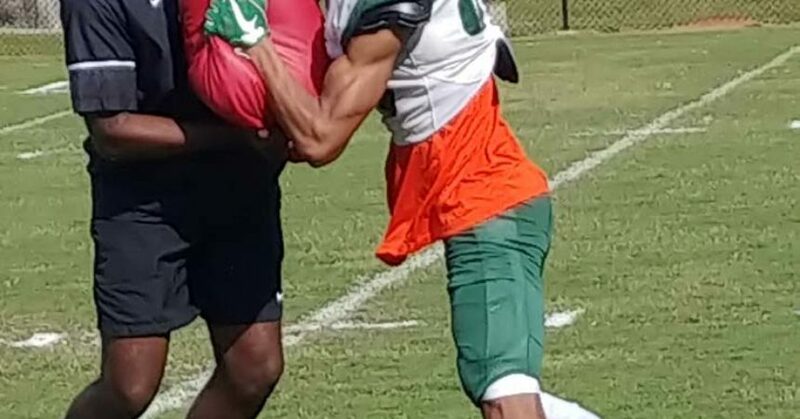 Willie Simmons saw a lot of things to be pleased about after his FAMU football team completed a mini scrimmage to cap its first week of spring practice last Saturday. He just didn’t see enough of running back DeShawn Smith, who had a breakout season last year. Smith was hampered by a muscle injury that he said made it difficult for him to run without pain. Smith attempted one run in his only rep during the scrimmage, then sat out the rest of the afternoon while four other running backs worked out of the backfield. Smith wasn’t the only player who found himself on the sidelines for various reasons, but Simmons said Smith can’t afford to miss too many days. The team is working an abbreviated spring schedule, one reason that Simmons would like Smith to be fully engaged in practice. 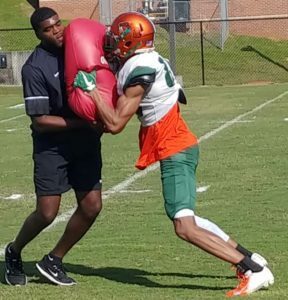 The Rattlers have seven more practices before the Orange and Green spring game on March 30. Simmons was especially pleased with the defense during Saturday’s workout. The unit showed fall camp-like sharpness in covering passes and stopping the run game. That’s what the focus will be during the upcoming weeks. “Obviously we have a lot of work to do but for a first mini scrimmage we won the day,” Simmons said. Quarterback Ryan Stanley demonstrated vast improvement over last season, when a back injury slowed him down during the last four games. He is 100 percent healed, Simmons said. Stanley seemed to have gained a few pounds of muscles, something that Simmons attributed to the team’s commitment in the weight room during the off season. “He probably put on five or six pounds of muscle but that’s pretty consistent with most of the guys on the team,” Simmons said.